As one of the premier smartphone platforms the iPhone and other associated devices like Apple’s tablets are well catered for when it comes to playing blackjack. There are free options available from the App Store and there literally 100s of real money casinos with blackjack that will work perfectly on your handset. Note:While the introduction of the Interactive Gambling Amendment Bill in September 2017 means Australians can no longer access online casino sites, many countries in the world have them readily available. The information provided in this article is for our international readers. Casino mobile websites are easily accessed and offer various version of 21. All you need is an Internet connection, and let’s face it, unless you live in a dungeon you are sure to be connected, and a smartphone and you can play real money blackjack on your iPhone. One exception to the app rule is Royal Vegas Online Casino, which has a native market app in the Apple App store. The Royal Vegas app is marketed in the App store as Regal Vegas, but once downloaded you have the option to play for real money (Royal Vegas) or play money (Regal Vegas). iPhones have eased accessibility around the globe and access to real money blackjack is no exception. 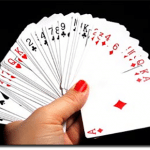 There are a few different ways to play real money mobile blackjack on iPhones and the method is purely up to you. Market apps: These are what we download to access directly from the home screen of our iPhone rather than from our Web browser, Safari. However, the majority of market apps for blackjack do not allow us to play with real money. One exception is the official Royal Vegas iOS app which is downloaded to the iPhone hard disk which we discuss below. 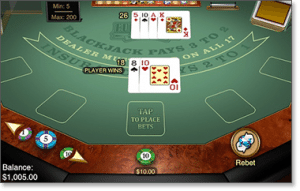 No download: If you want to access real money blackjack without having to download anything then this option, called Instant Play, is for you. Access is via our mobile web browser such as Safari with plugins such as Flash, Java or HTML5. If you would prefer to be playing instead of waiting for the installation of an app, this option is a no-brainer. Web apps: Get the best of both worlds when playing real money blackjack. This option is accessed through Safari, however, it is also accessed by creating your own web app. Through the iPhone instant-play casino an Internet application on the home screen is made. Web apps take only seconds to create and provide a handy alternative for mobile blackjack casinos that do not offer downloadable iPhone apps. Royal Vegas was one of the first online casinos to offers a legally accessible application from the App Store and not only offers amazing real-cash 21 but also offers more than 45 other casino games, including roulette, slots and video poker. This is an official market application, available to iPhone users through the App store and iTunes. So there is no need to go in through Safari and access mobile blackjack that way, instead you have your very own portable version on your iPhone’s home screen – deleting any time for awkward small talk in the coffee line. Once downloaded from the App store click on the small RV icon that has made itself at home on your iPhone screen and you will then be taken to the sign-up screen. If you already have an account with Royal Vegas online casino, use those log-in details, otherwise sign up, which will take less time than it does for your computer to start up. Or if you want to trial the app, click ‘already have account with us’ then click ‘practice play’. This gives you the chance to get a feel for the games without using real money. 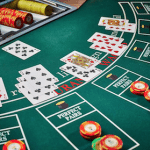 Click on the Games icon, either in practice or real play, and then on table games where you will see an array of blackjack games including Atlantic City Blackjack Gold, Classic Blackjack Gold, European Roulette Gold, and European Blackjack Gold, and let the fun begin. Note: The app will be listed as ‘Regal Vegas Casino’ in the App Store. The is how the product is branded for free play; ‘Royal Vegas’ is the real money mode. This is all one single app; there is no separate download required for real money casino games. Besides Royal Vegas, it is illegal for online casinos to offer apps on the Apple App store. But this doesn’t mean our highly recommended online casinos are lagging behind, with our three favourites offering mobile platforms direct from their websites. These online casinos that support iPhone blackjack know very well the importance of being able to easily access content from anywhere, anytime, without compromising security. Guts Casino provides an outstanding mobile website for Apple users, and the Instant Play mobile platform features an array of blackjack options including European Blackjack Gold Series, American blackjack and another just called Blackjack. The Guts mobile casino is among the best on the Web, with just under 100 real money games for your iPhone. G’Day Casino offers dozens of mobile releases from several software developers such as BetSoft, NetEnt and NYXGaming, in an all-Flash interface. The mobile version offers American Blackjack taking the popular table game and adapting it flawlessly for real cash iPhone play. If you enjoy the theme G’Day offers through their web browser, you won’t be disappointed with their mobile version. Royal Vegas Casino also offers a mobile version accessed through Safari complete with home screen install and an instant play option. This is our favourite casino and offers amazing real money blackjack. Playing iPhone blackjack is as easy as counting to 21. Decide which casino, whether you would rather an app, instant play, or both, and then open an account, or login in with your pre-existing details, and make a deposit. Most mobile casinos also offer great sign-up bonuses. For example Royal Vegas offer $1200 in free credits for new players. Enter the world of iPhone blackjack from wherever you are – including when you need a break from your thrilling work schedule. Mobile 21 offers the same excitement as online blackjack and you will notice everything is much the same as the web version only more accessible. Just because we are playing mobile 21 while eating lunch in the park, doesn’t mean our security is compromised. Our highly recommended mobile blackjack websites use 128-bit SSL (Secure Socket Layer) Digital Encryptions to ensure all your transactions are secure. This means we are still getting the same protection via mobile as you would playing at home on your computer. Payment options are still the same and the convenient mobile banking options include credit and debit cards, E-Wallets, Web cash vouchers, and instant banking. Access safe casinos in the table above or visit Royal Vegas Casino on your iPhone, the top recommended online casino for real money blackjack on mobile and on-the-go.